Studies of Rodin’s Pierre de Wiessant (reduction of one of the Burghers of Calais) can be found at a variety of American institutions. 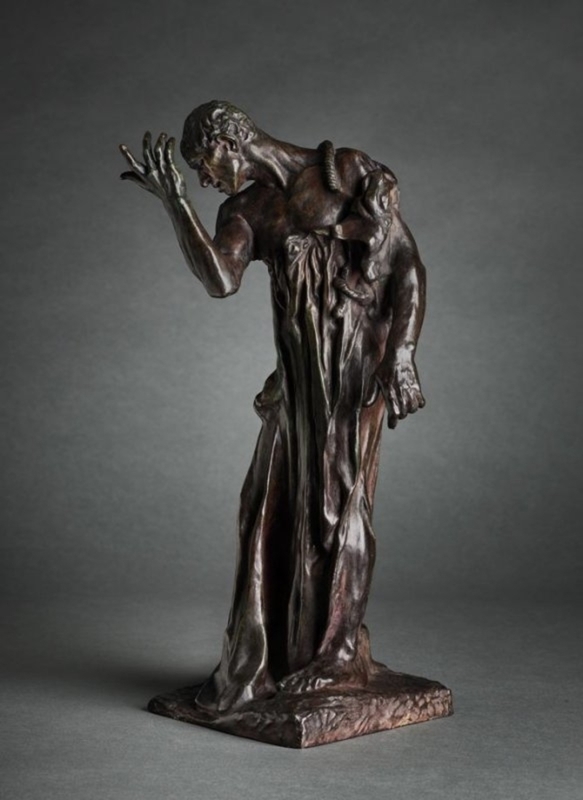 In California alone, Pierre and the rest of The Burghers of Calais can be found at the Fine Arts Museums of San Francisco’s Legion of Honor, Iris & B, Gerald Cantor Arts Center at Stanford University, and Los Angeles County Museum of Art. Rodin’s studies and sculptures can also be found in the collections of the following American institutions: The Metropolitan Museum of Art, Rodin Museum in Philadelphia, Brooklyn Museum, Harvard Art Museum, Museum Fine Arts Boston, and National Gallery of Art Washington, D.C..
You could say my first introduction to art was with these sculptures at the Legion of Honor on a school field trip. I remember vividly that the docent was a snore and because of that I decided to take matters into my own hands and touch a variety of Rodin’s sculptures as we walked by. Bad, yes, but I would argue this first interaction with Rodin began my life-long adoration of art history and this artist. But enough about me. Pierre de Wiessant (reduction of one of the Burghers of Calais) represents one of the six citizens of Calais who offered to sacrifice themselves in order save the city from the English during the beginning Hundred Years’ War. Rodin followed the story of French chronicler Jean Froissart who is believed to have witnessed this remarkable event. If the tale is true (many disagree on the facts behind Froissart’s recollection of events), six of Calais' most prominent men, lead by hero Eustache de Saint-Pierre, struck a deal with England’s King Edward III to sacrifice only them and save the city from complete destruction. The king then ordered the beheading of these six citizens, and Rodin captures these figures as they realize their fate. But Queen Philippa was so moved by their sacrifice that she convinced her husband to not only spare them, but also spare the town. Each of the six men represent a unique representation of the moment one realizes they are about to die, unaware that in the end their lives will be saved. Anguish, distress, and disbelief are all emotions Rodin brilliantly captured in bronze - a feat that is still to this day celebrated. The Burghers of Calais have been studied, written about, and admired since their creation in 1895. But please, do as I say, not as I do and do not touch these bronze sculptures in the many museums you can see them around the world. The only place you could probably get away with getting up close and personal with these artworks is, ironically, at the Musee Rodin itself in Paris, where a beautiful sculpture garden full of Rodin’s masterpieces come to life. So book one of those cheap flights that are circulating around the interwebs and come see the original. “Rodin Collections In The World.” Musee Rodin website. Accessed December 18, 2018. http://www.musee-rodin.fr/en/collections/rodin-collections-world. “The Burghers of Calais.” Metropolitan Museum of Art website. Accessed December 18,2018. https://www.metmuseum.org/art/collection/search/207812. Offenstadt, Nicolas. “History Refuses To Look Kindly Upon the Good Burghers of Calais.” The Guardian. August 14, 2002. Accessed December 18, 2010. https://www.theguardian.com/education/2002/aug/15/highereducation.news.